Watery wildlife is the theme of the Dolphin Quest pokie, which is unsurprising really, given its’ name. What is somewhat surprising is the overall design, and the unusual bonus round, which may be quite brief but can lead some pretty good payouts. This game comes from Microgaming, based on the Isle of Man in the UK. 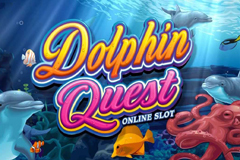 Microgaming are one of the most prolific developers in the world, and have built up an enviable reputation for high quality games and fair play, with Dolphin Quest being another example of their output. What’s immediately apparent with this game is that the symbols appear to be floating against a backdrop of a coral reef, which takes up the whole screen and gives it a 3D appearance that looks good, but can take a bit of getting used to. It’s got 5 reels and 50 lines, with players able to select bet sizes from just 0.01 all the way up to 250.00 per spin by adjusting the number of lines they wager on from 1 to 50, the value of a coin, from 0.01 to 1.00, and the number of coins per line from 1 to 5. By clicking the View Pays link, players will be able to see what each combination of symbols will be worth, with all the values displayed being multiplied by the coins bet per line. Each symbol will pay a prize when landing across at least 3 adjacent reels, starting from the left, on an active payline, with another unusual feature being that 4 of the symbols; the hermit crab, school of fish, seahorses and puffer fish all have the exact same value. Moving up the pay scale, the lion fish and stingrays are also of the same value, and the octopus and turtle are the most rewarding of the standard symbols when landing across a line. It wouldn’t be called Dolphin Quest without a few of the cute cetaceans making an appearance, so they fill the top spots with nice pictures of the playful critters, while the Dolphin Quest logo has by far the highest value in the main game when it lands across the line. It’s also a wild symbol that will help players complete extra winning combinations by acting as all but the scatter symbol, plus there’s an added bonus that it can appear stacked on a reel, potentially completing several lines at once. The scatter is a couple of golden dolphins, which looks a little out of place next to the more realistic images of sea life, but as it triggers the main bonus round here, few will complain. Any time at least 3 scatters land on the reels, in any positions, players will start the actual Quest of the title. It takes place on a second screen where we see just 3 reels set against waterfalls. Prize amounts fill each reel, and all players have to do is click to stop each one in turn and the amounts that stop in line with a pointer will be paid out. Some of these can be pretty substantial, like 3000 coins on each one. There’s no free spins round, and this one is over pretty quickly, but it’s guaranteed to bring some wins, so few will miss having other bonus rounds when this one is so rewarding. Will Players Click With This Game? Eye-catching and colourful, Dolphin Quest has some distinct features to it, that help it float above many other pokies. The logic behind having so many symbols with identical values escapes me, although it doesn’t really distract from the run of play. The smooth animations and sharp graphics that Microgaming are known for will be found here, while other highlights of the game include an excellent range of flexible bet sizes and the stacked wilds. It’s definitely a game to try out, even if the underwater theme is somewhat over-used in the online pokie world.